A recent murder in Belfast highlights the continuing reach of paramilitary groups in Northern Ireland. Alec Forss discusses attempts to break the cycle of violence. On April 15, Michael McGibbon had a reluctant appointment to keep. Scheduled for 10pm in a North Belfast alleyway, he arrived to receive his punishment: three bullets fired into his legs, one of which severed an artery. He bled to death, despite the efforts of his wife to save him. Three days later another man, 25-year-old Harry Boyle, was shot in both legs, sustaining life-threatening injuries. More attacks have followed since. Over 6,000 such “punishment attacks” have been recorded in Northern Ireland since the troubles began, nearly half of which have occurred after the signing of the Good Friday Agreement in 1998, which brought an official end to the conflict. During the Troubles, in the absence of a formal policing role, both Republican and Loyalist paramilitaries sought to fill the vacuum by protecting their neighbourhoods as well as meting out “community-sanctioned” justice for offences ranging from alleged anti-social behaviour (with drug dealers being notable targets) to more serious “crimes” such as informing. Shooting the victim in the back of the legs (popularly known as kneecapping), as well as elbows and ankles, was part of an incremental scale of punishments all the way up to exile or execution. While having tapered off since their height in the early 2000s, according to the latest statistics from the Police Service of Northern Ireland (PSNI), there were 84 paramilitary-style assaults between March 2015 and February 2016 – with the number of assaults having risen slightly year on year since 2012. Such attacks have targeted children, mostly teenagers, with 39 attacks reported between 2009 – 2015, though Koulla Yiasouma, Northern Ireland Commissioner for Children and Young People, notes this figure is probably much higher, with many incidents going unreported. 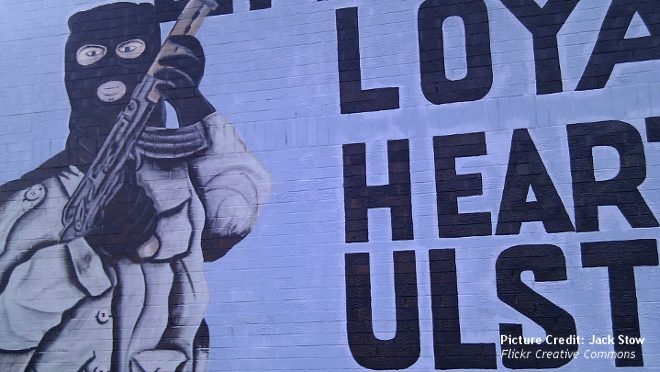 Today, such attacks, committed mainly by dissident paramilitary groupings, remain a stubbornly residual and violent feature of the post-conflict landscape in Northern Ireland, especially among some close-knit working-class communities in Belfast. Furthermore, this reflects only the brutal edge of wider scale low-level intimidation such as verbal abuse and forcing people out of their homes. Indeed, high levels of psychological distress and post-traumatic stress disorder are reported in such communities. That such attacks and intimidation by paramilitary groups continue, nearly two decades after the peace deal, raises important questions of the policing and justice system, especially of the role of community restorative justice (CRJ) efforts. First trialled in Northern Ireland in the 1990s in the early phases of the peace process, CRJ aims to rehabilitate offenders with communities by providing an alternative to the conventional criminal justice system. By employing mediation, community service, education and training methods, CRJ schemes seek to address a range of community-relevant issues, including anti-social behaviour, neighbourhood disputes, suicide intervention and monitoring at interface areas. In so doing, it also circumvents the rationale for resorting to paramilitary punishment. This can involve, for example, facilitating meetings between potential victims and representatives of paramilitary groups on neutral ground to discuss offences (whether perceived or real) and agreeing on non-violent solutions. From the early days, when such schemes came fully under the purview of paramilitaries, they have since evolved to more formal supervision and accreditation under the official justice system led by the Criminal Justice Inspection of Northern Ireland. Whereas this had been previously viewed as unacceptable by Republicans, the IRA’s decommissioning of arms in 2005 and Sinn Fein’s formal recognition of the PSNI in 2007 were major milestones that saw CRJ increasingly come into the mainstream. Various accredited CRJ schemes exist today: five Loyalist community-based restorative justice schemes supervised by Northern Ireland Alternatives, and nationalist schemes under Community Restorative Justice Ireland with activities in North, West and South Belfast. The practice of CRJ has coincided with a marked decrease in punishment attacks. According to an evaluation of CRJI and NIA, between 1999 and 2005 “nearly 500 cases [in Belfast and Derry] that, without intervention, would have ended in beatings, shootings and/or exclusions were resolved peacefully.” As such, they have also significantly squeezed the space for community “approval” of punishment attacks, even if a small minority continue to turn to paramilitaries for more immediate redress. Yet pin-pointing such schemes as being solely responsible for a decrease in attacks is too simplistic an explanation. And recent statistics regarding ongoing schemes are not publically available. Furthermore, CRJ does not exist without controversy. While difficult to verify, criticism has been voiced that, in some cases, CRJ schemes may tacitly legitimise the role of paramilitary groups, who may have undue influence over terms of the mediation process and continue to reserve the right to dole out punishment should the offender be perceived not to be following the terms agreed. Besides, where attacks are motivated by internal ‘housekeeping’ (targeting disobedient paramilitary members), or meted out as a result of personal grievances or slights, the logic of the bullet still holds an atavistic appeal to those accustomed to violence. As long as paramilitaries continue to exist and hold sway over some communities, punishment attacks will continue despite the best efforts of CRJ schemes. Nevertheless, Northern Ireland has come a long way in the last decade towards a formally supervised, community-driven justice system that offers potential victims, and by extension their families and neighbourhoods in which they live, a more enlightened alternative to the injustice of a bullet in the leg. This article originally first appeared on Insight on Conflict on August 10. Alec Forss is Editor at ISDP.